The media in the Crystal Ball for the Bath is an extra fine KDF® filament which provides an extremely large and highly efficient surface area for the rapid reduction of chlorine as well as the destabilization of chloramines (chlorine and ammonia). During the five to eight minutes required to fill the tub with hot water, the agitation of the water flow and the movement of the media pouch being pulled through the water, combine to enable the media pouch to remove up to 100% of the chlorine from the water in bathtubs, bathinettes, pails, etc. The Crystal Ball for the Bath also contains one ounce of high energy virgin American crystalline quarts. The quartz has the effect of reducing the surface tension of the water and increasing suds and lather. 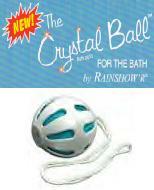 The media is enclosed in a replaceable pouch inside the Crystal Ball for the Bath. When water comes in contac with the media filament (KDF Formula 73) inside the fabric pouch, the chlorine ions in the water are converted into a harmless chloride. The toxic effects of chlorine, chloramines and chloride gas are eliminated with the aid of a special medi. More chlorine is removed wuickly whe the Crystal Ball is circulated through tge water. The quartz crystals, from which it derives its name, mixed with the media reduce the molecular structure of water into smaller clusters, thereby allowing enhanced sudsing and lathering of soap. How to Use the Crystal Ball. You may hang the Crystal Ball for the Bath on the tub faucet while filing the tub with bath water, however, by holding the Crystal Ball by the attached 12 inch cord, placing it in the water and pulling it through the water several times accelerates chlorine removal. 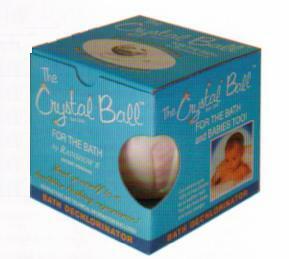 Complete infant bathing instructions are included with each Crystal ball for the Bath. The plastic ball housing - 1 year from the date of purchase.